Despite the threat of volcanic eruptions, the island's rugged beauty, friendly people, old fashioned values and peace and quiet make some tourists return year after year. In the words of so many property owners in the island, "where else can you leave your door unlocked without fear?" From about 12.3% of GDP in 2004, the size of the mortgage market expanded to 32.1% of GDP in 2013. However last year, total housing loans outstanding fell for the first time by 1.8% in 2014 from a year earlier. In April 2015, the prime lending rate in Montserrat stood at 8%, unchanged from a year earlier, according to the ECCB. Likewise, interest rates for residential mortgages stayed steady, with a range of between 5.99% and 9.5%. Loans for house and land purchases dropped 11.2% y-o-y in March 2015 while loans for home construction and renovations rose by 6.7% over the same period. About 67% of the loans were drawn for home construction and renovation while the remaining 33% were used for house and land purchases. 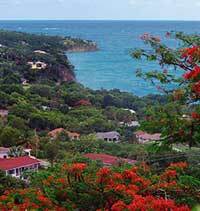 How much tax must foreign owners pay when they rent out their Montserratian property?